Do you need training, but have a busy schedule and want to work at your own pace? Online ANYTIME (OLA) training at New Horizons Learning Group provides a convenient and flexible eLearning option. 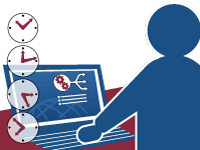 Available as a web-based and computer-based training option, Online ANYTIME allows you to access your courses at home, from the office, or on the road anytime, day or night, without any investment in servers, licensing, or software. If you prefer an independent learning approach, Online ANYTIME is a great option. New Horizons Learning Group designs each course to include a definition of learning objectives, instructional strategies, and appropriate learning activities. Broken down into searchable modules, Online ANYTIME allows you to easily find different parts of the course on which to focus. Do you have a busy schedule and need to find time to fit in training that will help your career? Online ANYTIME (OLA) training at New Horizons Learning Group gives you a flexible and convenient eLearning solution. Online ANYTIME enables you to access your training courses from home, work, or while on the go through web- or computer-based training options. This means that you can work day or night without having to make a new investment in servers, licensing, or software. Online ANYTIME training is also a great option for those who prefer an independent approach to training. We design each of our courses to define learning objectives, instructional strategies, and corresponding learning activities. New Horizons’ OLA training courses are searchable, meaning you can easily find and access different parts of the course you studying at any time. Just as with the traditional classroom courses you will find at New Horizons Learning Group, Online ANYTIME is based on the same core content. The interactive learning experience incorporates different tools and techniques while still being extremely easy to use. Practice questions and assessments test your absorption of the material so you can measure your progress along the way. You are able to work on your skills at your own pace with unlimited access to course information. This option does not mean that you are studying and learning on your own without direction. New Horizons’ vLab allows you to get a hands-on experience during the course so you can connect concepts you learn with actual hardware and software applications. Practice and enhance your skills using the vLab so that you are able to gain the experience you will need now and in future job tasks. New Horizons Learning Group also has Test Prep Assistance options for those who want to obtain specific technology certifications. This program uses questions that are specifically designed to prepare you for what you will see on vendor certification exams. With time limits on your activities you will also be able to test your efficiency before entering the test setting. A study mode is also available to provide you with feedback on right and wrong answers to your questions along the way. We’ve partnered with different vendors, analysts, business thought leaders, publishers, and senior executives in your industry so you can have immediate access to the best course materials and content that will be beneficial. All of this information is available 24 hours a day. Online ANYTIME provides access to a large print library and around 1,000 videos available on demand. The videos cover a range of topics that focus on various tasks and features associated with your course. This gives you the ability to get even more out of your training and become more familiar with key software applications and hardware. Whether you want to find a basic training course or are looking to learn and master advanced technical skills, New Horizons’ Online ANYTIME courses are the perfect choice. With more than 1,200 courses available—and more being added all the time—we are here to help make sure your skills are up to date. Some of our Online ANYTIME courses also come with access to mentoring services from our professionals. Mentoring is a valuable addition to your training, which you can receive through email, online chats, and discussion groups. New Horizons Learning Group has Account Executives and Education Consultants ready to answer your questions. Call (888) 825-6684 to learn more or schedule a course.